When it comes to Christmas, Richard and I do not get each other gifts. Or rather, officially, we only do stockings for each other (you can stuff a lot of books and things from ThinkGeek into a stocking, in other words). And then we get a joint Christmas present, like tickets to go see Jonathan Coulton perform, or a really fancy dinner out. Or, in the case of this past Christmas, a whole pile of brand new office furniture. 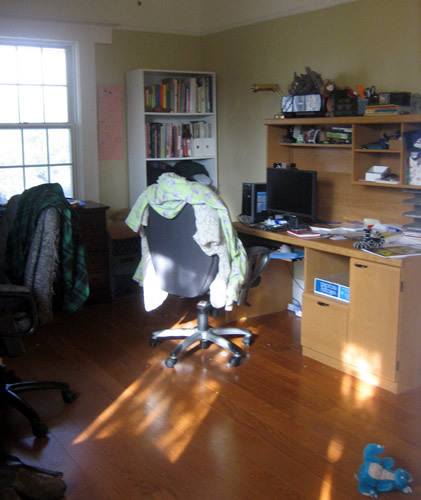 When we moved into this house, we did not have computer desks (the desks in the old house had been built into the room, so they weren’t exactly the kind we could take with us). We found some extremely cheap desks on Craigslist and bought them, figuring they’d work for the short term. 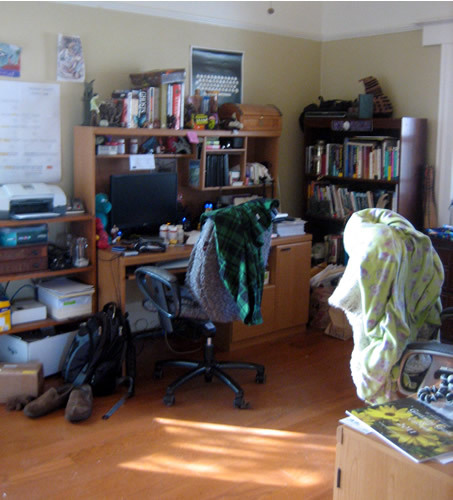 This was my half of the office. And this was Richard’s half of the office. The cheap desks were too low and a bit wobbly and the keyboard shelf on mine had a tendency to fall off at random, spilling keyboard and mouse onto the floor and inducing panic in the cats (at the noise) and swearing from me (as I often had to crawl under the desk to retrieve the mouse trackball which would inevitably roll into the one area under the desk that was hardest to get to). The desks were only meant to be a temporary fix (those and a random assortment of bookshelves acquired over our college years from various garage sales, and a file cabinet whose gorgeous exterior hid the fact that the bottom of the drawers tend to fall off if you look at them cross-eyed), but what with the kitchen remodel ending up costing a bit more than expected (thanks to the need for the giant supporting beam in the attic) and the recent round of furloughs and paycuts, we’ve been dealing with them for a bit longer than we’d expected. The furloughs and paycuts, however, had a silver lining. We learned how to live on a lot less, during the past twelve months, so that when we had our full pay restored, suddenly we were able to put a lot more into savings, and this year, Christmas brought a trip to Ikea. We came home with seven very heavy boxes. 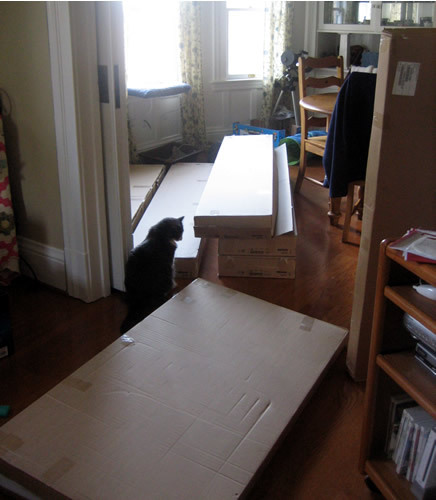 Or rather, since Ikea has a delivery service, we came home with a receipt and the next day, a pair of extremely strong young men carted those seven very heavy boxes up the full flight of steps to our front door. We started putting together the first desk on the morning of Christmas Eve, and then finished it up on Christmas Day. The first bookshelf followed, then the second desk and bookshelf (which went significantly faster than the first set, due to the fact that there was far less staring cross-eyed at the directions and a random assortment of hardware, muttering things like ‘wait, is it supposed to go like this, or like that?’). A new cabinet to hold all the routers and various electronic gizmos necessary for running network / cable / phone, a new file cabinet to live in the coat closet, a new window perch so the cats can still have a comfy place to watch the squirrels dash up and down the giant elm trees on the street, and today, we finally were done. This is my side of the office. 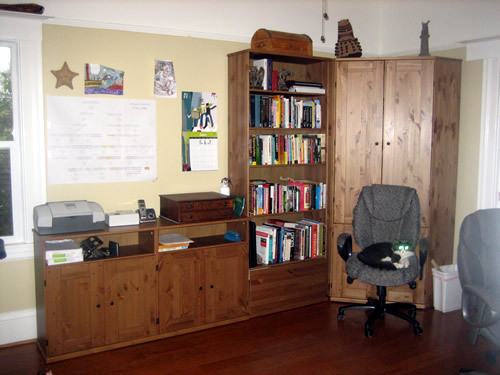 And this is Richard’s side of the office. 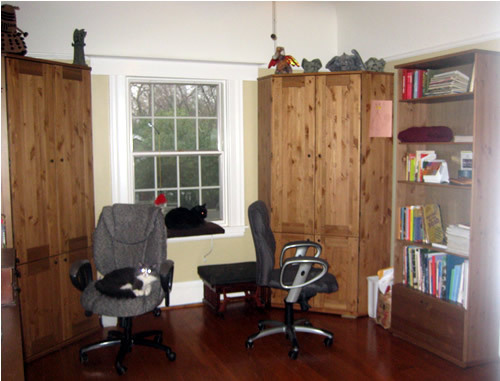 Notice how the desks have doors, not only to hide the fact that neither of us is a particularly organized person, but also to keep cats out when we’re not there to supervise them. All the electronic gadgets are safely tucked away in that low cabinet along the wall, again out of reach of cats (some of whom were very good at turning off surge protectors). As an added bonus, all the new furniture is low enough to the ground that cat toys cannot be shoved underneath (and Ingrid was especially happy that when we moved out the old desks, we unearthed one of the little Cow toys she adores). They look very nice…but obviously you need a LOT more books to catch up with Richard!